Hi Ladies! I hope you’ll join us for the 2019 BOM. Colleen will be coordinating it for us. 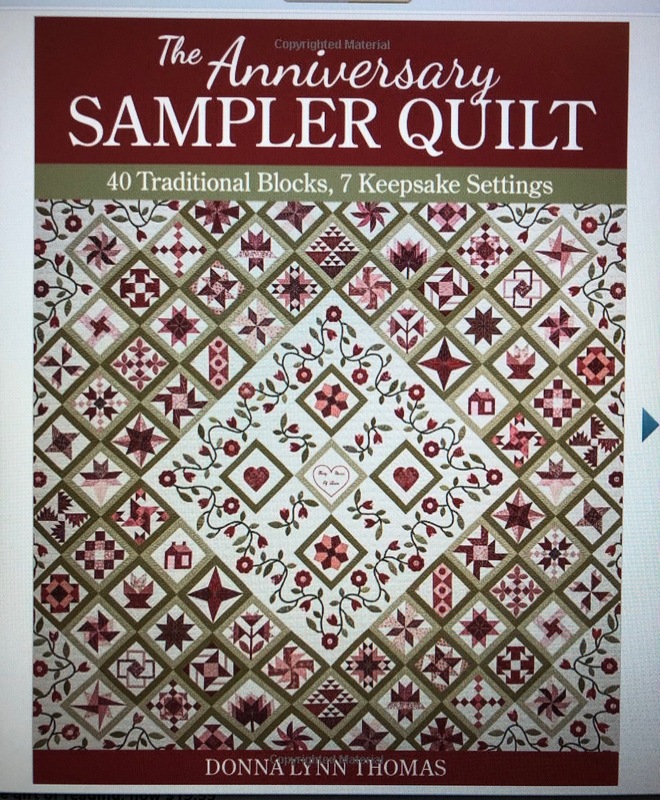 We love this book, The Anniversary Sampler Quilt, and have come up with a way to make it together while making our own quilt design! It can be done in your favorite color way, or it can be scrappy. 1. We will end up with 24 blocks completed for the BOM program. HOWEVER, there are 40 in the book, so you can add other blocks and create your own design. 3. We will make only the pieced blocks as BOMs (well, unless someone wants to tackle the appliqué blocks for us!! That would be awesome, you appliqué experts - you know who you are). This can be completely scrappy, but if you want all your background and sashing to be the same, you will need 4 1/2 yards. This quilt finishes at 68" x 84 1/2"
Note: There is a correction to the instructions for block 1. Note on Block #3, Page 4 of the instructions I noticed a minor correction. #3 Mailbox flag, the part with the pole finishes 2 x 2 1/2 not 3 1/2. This was just a typo on the instructions. You may not even notice. 2011 Applique from "The Needleworker"